Wanted to send an update after our final Red Cross concert. We set a goal of $1000 per show to raise $300o per show. Total donations received 4105.78 YAHOO! Great job and thank you to everyone that contributed to the fund raiser. Big thank you to Lulu Cerone and her Lemonade Warriors. They came to every show and helped collect the donations for the Red Cross. They did a great job and we look forward to working with them again very soon. You all rocked! Special note to our biggest contributor. Jake Greenspan (Sax and Piano) collected close to $1700 in donations for the Red Cross and brought them to our fund raiser on April 17th. Great job Jake! You donations definitely put us over our goal. Overall the shows went well and we continue to see great growth with our Band Members. We did have some sound issues with the shows on the 16th and 17th. These were mostly due to inexperienced sound engineers and in some cases lack of experience with our Band Members. The biggest challenge we face with the concerts is the sound. Besides all the logistic issues of putting on a show, the competence and experience of the sound engineer can make or break the experience. Good or bad it is always a learning experience. Of course we would prefer to always have great sound for every band and every show. In the real world of working in clubs and sound engineers that will not always happen. I’ve done many shows with awesome sound and I’ve done many shows with awful sound. We need to also remember that all the kids are learning how to play live and make adjustments. This in itself can be a challenge for sound engineers. A great engineer can’t make up for lack of experience on stage. Sometimes (not on our approval) our Band Members turn up the amps or turn them down. Sometimes they sing to loud, to soft or way off the microphone. All these level changes make it hard for an engineer to make adjustments on the fly. A guitarist that turns up the stage volume on his amp has to be taken out of the “house mix”, and at the same time he is drowning out the singer. A sound engineer can’t fix that. That is on the performers to create a good balance on stage as they play, and that takes years of experience playing many different clubs, with different bands and different stage equipment. A great way to learn more about this is to watch a professional band do a sound check. You could also come to your JTB show early and watch the Band Leaders set the stage volume level, work with the engineer, run through a song and make adjustments. Playing on stage takes years of practice to master. Everyone will experience the good and bad. Enjoy the ride and make every gig a learning experience. What a fun weekend! Harper’s on Friday and The Mint on Sunday! This was our 75th concert weekend and as expected it was a very fun experience. The preparation everyone put in really showed. The Harper’s show featured our Adult rockers, a blues band and a special appearance by one of our kids bands. We may mix this up a bit more (Adult band with a couple kids bands) in the future as the response to the whole evening was very positive. The Mint on Sunday was also a great day. From set up to tear down, everyone had a very good day. We flipped the schedule around this time so the younger bands got a chance to see the advanced teen bands perform. This also turned into a plus. I received a lot of great feedback regarding the schedule. Everyone at the show heard bands of different ages and levels perform.Very inspiring for everyone. Of course we had a few hiccups but everything worked out in the end. One band had a drummer that couldn’t make the show due to a bad ankle sprain. Kudos to Rosh for learning the drums on short notice and Ryan on bass to shore up the band. They kids had a great set. Remember, stuff happens when you play live. People are late, don’t show up, get sick, injured, etc… you name it, most experienced performers have seen it all. You just find a way. Dwelling on what when wrong and reacting to situations never solves anything. You have to focus on the solution and not the problem. The past year was very fun for JTB. We made a lot of new friends and are looking forward to seeing everyone in the new year. We really enjoy watching the growth of our Band Members. As stated in previous posts, we strongly believe that steady growth comes from the inside out. We want our students to understand the core of what they are learning. From there they can accomplish anything! Join the Band Music Program with our friends at 4GOOD are sponsoring a fund raiser this Saturday for Education Through Music – Los Angeles at Flappers Comedy club in Burbank. The concert will feature kids from the ETM program as well as JTB bands for a fun afternoon of music. Education Through Music – Los Angeles, is a great program bringing back music classes to local schools that have lost funding. Music can play a vital role in the development of young students. We fully support ETM in “Bringing The Music Back” to those who do not have access to music programs in their schools. At only 11 years old Lulu Cerone has been with Join the Band for just about three years now. In that time she has not missed a single session. She has performed in 22 concerts, learned 56 songs and has proven to be a great team player by showing support to all of her band mates. Way to go Lulu! You are our Combo Queen! “If my life was a book, there would be two chapters; Before Join the Band, and After Join The Band. Before JTB, I thought studying music meant sitting by myself at a piano playing kiddy songs, or classical music that meant nothing to me. It was lonely and boring. After JTB, I realized the hard work pays off when you play exciting music, with friends who make it fun. I started practicing more and music became my obsession, instead of a chore. Before JTB, I was shy. Really shy. My teacher, in January of 2nd grade, said that I had not raised my hand once all year. After Join The Band, I became so confident on stage, that I am able to talk to large groups of people without any nerves at all. My speech for student council helped get me elected, and in October I was invited to New York to talk to a huge convention of people about my LemonAID Warriors fund raising organization. I can’t imagine doing this without all the experience in front of an audience with my bands. Before Join The Band, I listened to music but didn’t really hear it. I thought music was either classical, from my lessons, or pop, that my friends listen to. After JTB, I realize that there is a universe of music out there from jazz to instrumental to classic rock. I hear all the instruments instead of just the song. I started taking drum lessons and voice lessons on top of piano lessons, and I have much better taste in music now! We look forward to having Lulu around for many more years of music and to work with her fund raising program Lemon Aid Warriors. Kids can make a difference! Every so often a great musician is revealed to us that goes beyond the norm. A players player that has their art down and passion for the music ingrained into everything they do. At Join the Band we have blues great John Marx. He is the blues jewel of Los Angeles. I first heard John play over 20 years ago in a small blues club in Burbank. I left very humbled by his dedication to the blues and how he approached every note and chord. He is a true student and scholar of the blues. Anyone that has spent any time with him knows he is a true blues man. He’s knowledge and passion for the blues is both encyclopedic and infectious. Check out John at one of his many gigs in the LA area or sit in on his Blues Workshops at our JTB studio and you will know you have been in the room with a true artist. Sitting in to play with him is a master lesson in rhythm, feel, and subtlety. You can’t BS your way around John. Music is first and BS is sent out the back door. John is a natural teacher and loves to share his passion for the blues. His true love of the blues is very evident in every JTB workshop he teaches. The “Join the Band Blues Workshop with John Marx” is our most popular workshop. Born and raised in East Baltimore Maryland, John began singing in church and for audiences at the age of six. He played the drums from ages ten to fifteen, and then took up the guitar to better accompany his singing. Players like John are a gift. We are very honored to have him involved with “Join the Band”! Great shows over the weekend! Overall Harper’s and The Mint worked out very well for our bands and we look forward to returning. Adult Concert – Harper’s – Friday, October 15th. Our first Friday evening gig was a lot of fun. We may look into continuing the time slot. As usual Trent, Scott and myself showed up early (4pm) to set up. First thing we noticed was a much improved sound system with an engineer that really takes pride in his work. When he (Rob) tested the monitors while we were setting up we knew we had the right guy. Last time we played at Harper’s the amps were not miked up. This time everything was miked and you all adjusted very well to lower stage volume. Harper’s is very typical of the type of gigs most bands play. If you can make it sound good there you doing your part. Kids and Teens – The Mint – Sunday, October 17th. Big thanks to the JTB Crew. Ryan, Rosh, Gene, Tom, Perk, and Scott. The 8am call time in The Mint parking lot was an early wake up for all us, but the show ran very well. Another thanks to Scott for helping with 3 shows over the weekend! We had a few bumps in the beginning and the AIDS Walk was a minor issue regarding traffic and getting to the club, but everyone made it on time. Our apologies for the late door time. There was mix up with the club regarding our start time and door time but we managed to get it going by 10am. The kids did great. Playing an intimate room like The Mint is very exciting. Everyone is close to the stage and you can easily see everyone. We noticed some of our Band Members were a bit nervous with the audience so close. In that environment it’s easy to lose focus, but overall we had a lot of great performances throughout the day in all age groups. Singers need to sing very close to microphones in clubs. Almost to the point of touching the mic with their lips. Even and inch away will dramatically change the volume level. This is especially apparent with very young singers that don’t have the lung power to fully project their voice. Singing guitarists and keyboardists very often look at their hands when singing and move their mouth away from the mic resulting in poor volume levels for their voice in the house mix. This was our 74th concert weekend over the last 12 years and it was a blast to see and hear everyone perform. There were quite a few break out performances as we continue to see our Band Members raise the bar. There were also a few mistakes during the shows but that’s what playing live is all about. Many of you have heard me comment on this before so please bare with me… (-: Playing live is the hardest thing to do as a musician. There are no 2nd takes or do overs. You get one shot. So preparation and experience is the key to having a successful show. I wasn’t playing clubs until my late teens but in JTB we have many Band Members getting stage experience at a very young age. Many of them have had great gigs and some that were not so great. But the not so great shows is were they are learning how to do better next time. If every gig was “perfect” they wouldn’t be learning anything. We all had to fall on our butts many times before we could walk. Nothing teaches you how to do something like learning from mistakes. You learn what doesn’t work and move on. JTB Stage comfort and Inside Out: Being on stage can really get into a performers head. That’s why we don’t try to fill our Band Members up with nonsensical poses and posturing. That comes naturally with confidence and more stage time. We believe that working on the inside first will make a musician stronger in the long term. Knowing the music to the best of their ability is the best way to build confidence. Filling their head up with stage posturing before they understand the music can be “cute” and fun to watch but it can also be very distracting to the what they are trying to play and result in a poor overall performance. We prefer to hear music with our ears not our eyes. Having said all that…Once the music skills are solid, performance (the outside) comes much more naturally to all students. I’ve been teaching guitar and coaching bands for over 30 years and can say that great performances are the product of solid music skills. I’ve seen students/pros stalk the stage that have minimal skills receive varied levels of response. But I’ve also seen/heard brilliant performances from students/pros where the music pours out of their bodies while hardly moving a muscle and bring the house to their feet. Music will also reach the heart if it’s heart felt. Look forward to seeing you all next time! I’ve always been amused by conversations (mostly guitarists) regarding learning to read music vs not learning to read. It usually goes something like this… “Dude, I don’t need to learn how to read music. I can get tabs off the internet and besides that I just play by ear and learning to read music will make me less creative…” Wow…If there was ever a perfect definition for ignorance that would be near the top of the list. Tabs on the internet…I prefer to call it “paint by numbers and connect the dots music”. Great artists/painters do not use numbers to guide them on what colors to choose, just as a great architect wouldn’t use connect the dots to design a house. It’s just amateur at best and there is very little skill involved in figuring out the basics of tab. Tab also does nothing to help you learn the names of notes and play rhythms. “I play by ear”… I love this one. All great musicians play by ear. Using this statement as an excuse for not learning how to read music is just silly. Great musicians that read music also use their ears. Therefore I would say that musicians that read music and “play by ear” have big a advantage in getting work over those that do not read. Music is a hearing art. We all have to listen to play better. We are also not say here that there are not great musicians that do not read music. Quite the contrary. Jimi Hendrix, The Beatles. BB King and many more have been very successful in the music business without having music reading skills. However, if you’ve ever read any interviews with these artist, most have expressed an interest in learning how to read music. Did know that BB King took guitar lessons from the guitarist in his band and also clarinet lessons to learn how to read music? Basically the point is, if you want to further your understanding of music, study theory, arranging, composition, take advanced level lessons etc… Reading music will only make it easier for you. There are tremendous advantages to learning how to read music and more doors will open for those that can. Great shows on Saturday and Sunday. Adult concert at Harper’s: Join the Band returns to the new Harper’s. We had eight bands perform for a lunch time crowd and everything went very well except for a tardy sound man. (30 minutes late) John wasn’t impressed with that. (I sound like Bob Dole). Harper’s is a very typical room for a gigging club band. The relaxed atmosphere was a great fit for our adult Band Members. I received a lot of positive feed back from our Band Members. For myself I would like to see them improve a bit more on the sound. Since the club just opened they are tweaking and making adjustments to really get it right. Note regarding kids and teens show: We did have to stop allowing cameras backstage. It was creating a lot confusion and we couldn’t get the kids focused on getting ready to play. For the next concert we will prefer to only have the kids backstage with our Band Leaders unless there is a medical reason why they should be escorted by a parent. If any parents want to volunteer to help us manage the backstage area that would be great too. Also. Parents. Refrain from lifting the curtain up at the shows to talk to your kids while we are getting them ready to play. One. It is dangerous if you somehow get snagged on it while it is raised. Two. If the Roxy staff see’s you doing it they will throw you out of the club. JTB Etiquette: I was also glad to see that we had good attendance at the end of both shows. All of our Band Members deserve the same support. Thank you for making that happen. We featured our JTB Teenstars at the Roxy Show and they delivered a great set. We traditionally haven’t singled out any one band in JTB but felt it would be fun to showcase some of our top teenage musicians with some very challenging material to inspire our younger Band Members. I hope everyone enjoyed their set. Special thanks to Joanne Paratore for working with our singers on Bohemian Rhapsody. It was a tall order but all the work and time paid off with a great performance. We look forward to seeing you all in our next session! Schools Out concert weekend is June 12th and Jun 13th. Lessons for Guitar, Piano, Voice, Drums, Bass Guitar and more! Serving Los Angeles area. Sherman Oaks, Van Nuys, Studio City and Encino areas. Join the Band – Marathon Jam 2010 – 70th Session Concert Weekend! 70th Join the Band Session Concerts- Wow! Don’t forget our next session starts March 1st. Concerts April 17th and 18th. Awesome concerts! A big thank you to our Band Members and Parents that supported the show over the weekend. We couldn’t put on these concerts without the help of our JTB staff. Ryan Gelber, Trent Stroh, John Marx, Rosh Roslin, Tom Neely, Scott Gilbertson, Perk, and all of our private lesson teachers. I would say this concert weekend was one of the best ever. We saw a lot of improvement from many of our Band Members and the support was great. Our blues workshop bands set the tone for the show with great performances all around. We also had a band of new Band Members that did very well on their first gig! Welcome to JTB! Our veteran Band Members had fun sets as did our jazz fusion teen band. The only drag on the show was the lack of support for the last two bands. Please remember that the final bands are there to see and support your set. Make plans to stay and support all of our Band Members so they share in the experience. The day progressed from kids/early teens to our teenage performers and we heard great sets from everyone. The attendance was strong all day and it created a lot of energy in the room. Of course with all the energy comes a few “hiccups”, but learning how react to anything on stage is what creates great performers. The more preparation and stage time you have the better you are able to handle situations as they arise. Remember, it’s not what happens as much as how you react to it. Preparation is key but things happen. Your guitar string breaks, your fingers freeze and you forget a part, you drop your drum stick, you forget the words, your amp sounds weird, your singer comes in to early or late etc… You can choose to be upset, flustered, worried etc.. Or you can take a mishap for what it is, learn from it and make the best of it. “What did you learn from the experience?” At the end of the day most people won’t even recognize a mistake unless it is a total “train wreck” or you telegraphed it to the audience. Playing live is the most challenging part of playing music. There are no 2nd, 3rd, 4th, takes, no “copy and paste” performances, no pitch correction etc… It’s you, your instrument, your band and the audience. At the end of the day that’s what it’s all about. Sharing your music with others. And if you should make a mistake along the way, so be it. It does happen, Most musicians I’ve talked with are never totally satisfied with their performances. Like most artists we are all striving for a perfect take, perfect solo, and we dedicate our time practicing to achieve that goal. Before the kids in my sons karate school exit the mat. The sensei asks, “Did you try your best today?” The kids respond with a “yes”. That’s all we can ask for. Do your best. All of our Band Members put it out there and they can be very proud of what they accomplished over the course of this last session. We also noticed higher comfort levels on stage, and as performers the only place you can learn that is by being on stage in front of an audience. At JTB we don’t try to “coach” kids into awkward stage moves. There are techniques we share with the kids but overall we have found that the kids and adult Band Members do much better when they are given time to grow into their stage personalities. It produces a more natural stage performer that is comfortable in their own skin. In the middle of “Full Counts” set at the Whisky, smoke started to appear on the stage. I actually thought something was burning on stage and a few parents showed their concern too. YIKES! It turned out to be a fog machine gone awry. I must say for a moment there it was freaking me out. GUITAR LESSONS IN LOS ANGELES serving Sherman Oaks, Encino, Studio City, Van Nuys, Tarzana, North Hollywood, Northridge, Woodland Hills. Where do I find a guitar teacher? What age is a good age to start guitar lessons? I have small fingers. Can I learn guitar? Should start with an acoustic or electric guitar? All of these are common questions to anyone starting guitar lessons. I’ve been involved in teaching guitar lessons for over 30 years and I’ve seen just about everything. Find a great guitar teacher by doing your homework. Call 3-5 music lessons studios and find out the qualifications of their teachers. Are they schooled musicians? Or are they kids just our of high school trying to make money by showing quick fix methods that will slow you down in the long run. If you want professional results hire a professional. Find someone that has been teaching guitar lessons for at least three years. Find guitar teachers that can read music and understand how to teach. There are great players that don’t communicate ideas well and less skilled musicians that teach very effectively. Ideally you want a great player and a teacher in one package. It may take a few attempts and trial lessons to find the right teacher but it is worth the effort. I have found that between 8-11 is a good age to start guitar lessons. Though I’ve had younger students the lessons are not very effective because of dexterity issues with young kids. Plus younger kids tend to lose focus very fast. Of course there are exceptions but they are just that, exceptions. Overall I’ve seen more success starting kids at age 10-11 than any other age. The size of your hands will not hamper your ability to learn guitar. If you want to play you will find a way. Avoid making excuses. They just keep telling your brain you can’t do it. Disregard negative thoughts and just go for it. One of the greatest guitarists of all time had the fingers on his left hand so badly burned in a fire that he could only play with two fingers. His name was Django Reinhardt. Four finger guitarist still struggle with his solos today. Start with a guitar that will get you excited to play. Find a friend or hire a guitar teacher to come with you and recommend a great guitar. Better a friend or teacher than a salesman on commission. At our Join the Band Music Lessons Studio we teach guitar lessons to kids and adults of all ages. We feature lessons in all styles of music. From rock, blues, jazz, country, swing, classical, folk, heavy metal and more. Our instructors are university trained and experienced to help you get the most out of your guitar lessons. 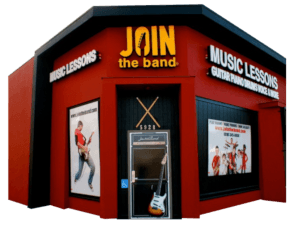 The Join the Band Music Lesson Studio serves the Los Angeles area including: Sherman Oaks, Encino, Studio City, Van Nuys, Tarzana, North Hollywood, Northridge, Woodland Hills. CALL 818-345-8950 to start you guitar lessons! Holiday Season and Happy New Year. In the past year our studio was filled with music and we are very thankful to our students and families for supporting our program. We have a great community of students and watching their growth over the year(s) has been amazing. I never tire of watching the kids/adults at our concerts. The look on their faces before they get on stage is always a thrill and the warm reception they receive from our JTB community is just wonderful. In 2010 we look forward to continue offering want you want in a music program. Private lessons, Band Classes, Concerts, Camps, Recording, Workshops and more. Welcome to our new Join the Band Blog page. Concert dates are Saturday, February 20th and Sunday February 21st. Our Holiday Jam concert on Sunday, December 13th was our 69th concert and our first show at the famous Roxy Theatre. Though we did have a few bumps during the day our show ran well. We also received nice gifts for our Toys for Tots drive. Your generosity is greatly appreciated. Thank you for all the support our Band Members received at the concert from family and friends. We had a great turnout throughout the day and it really makes the day exciting for everyone. I hope everyone had a fun experience. The energy level in the room was high all day and we had great performances from our bands. Playing on a new stage at any level of your playing can be tricky. The sound is different, the club staff has their own way of “doing things” and everything feels different. Performing live is one of the most challenging parts of being a musician. There are so many variables and you are performing in the moment. Unlike recording music and/or writing there are no “do overs’ or re-writes. What you play in the moment on stage is the keeper. The more shows you play the better you will get at adjusting to live performance. There is no substitute for playing live. You can rehearse four hours a day, buy all kinds of cool equipment, and get coached by great teachers, but the moment you get on stage it’s just you, your instrument, the audience and all the “unknowns” that may come your way. How you react to the “unknowns” is what makes you grow as a musician and performer. Thank you to our Join the Band team. It was a long day and everyone held together. Without them our shows would not run as smoothly as they do. You were all awesome at the show. We are splitting the show next time and having bands play on Saturday and Sunday. The marathon concerts are fun but they do take a lot out of our staff. Next session starts January 4th. Concert weekend is February 20th and 21st. My name is Louis Hoffman I am your typical band teacher; I play a bit of most everything and am always looking for new and exciting learning opportunities for both my students and myself. One of the toughest challenges for and young and old musicians is finding a place and a reason to keep playing. Music is such a solitary pursuit, with hundreds, even thousands of hours of practice time. It can be boring, disheartening and monotonous and without some kind of an outlet, many if not most beginning musicians just stop playing. For most people I know they learned the piano, guitar or maybe they even dreamed of singing, but they never got out there and just played live in front of audience, performing music they loved and wanted to play. In general, traditional music education centers around the musical genres of classical, folk and jazz, but most contemporary styles (blues, r & b, rock, funk, punk, pop, disco…) are simply not address in our schools. So, many a budding musician heads down to their local music store and learns some basic techniques on their instrument of choice, a tune or 2, but by-and-large it ends there. What’s missing is MENTORSHIP… and that’s what Join The Band offers. A professional and gifted musician and teacher in the studio, guiding a group of likeminded individuals through the rehearsal process, comminuting in a performance at real venue. Having a goal, a performance date, in an appropriate learning environment with quality instruction makes all the difference. By the way, I am not just a fan, but an active member too. I am now on my 3 workshops, made some great friends and am having an absolute blast just making music.